As part of the PMP (Project Management Professional) certification, a candidate must submit prior work experience that fits in with the project management knowledge areas and process groups before getting “approved” to take the PMP certification test. Below is an example of a PMI (Project Management Institute) email a candidate receives after their application was accepted. The email is said to arrive typically within 5 days. The email also states if your application was selected for an audit, and in this example an audit was not conducted. Your PMP® application has been accepted. You have one year from “” to sit for and pass the exam. Visit the PMI Certification page to find important information as well as your respective certification handbook. THE NEXT STEP in the process is to submit payment. You have one year from the date your application was accepted, which was “”, to sit for and pass the exam. This time is known as your exam eligibility period and is discussed in detail in your respective handbook. Before you can schedule your examination, please submit the exam fee. You will need to choose center-based testing (CBT), online proctored test (OPT) or paper-based testing (PBT) when paying the exam fee. 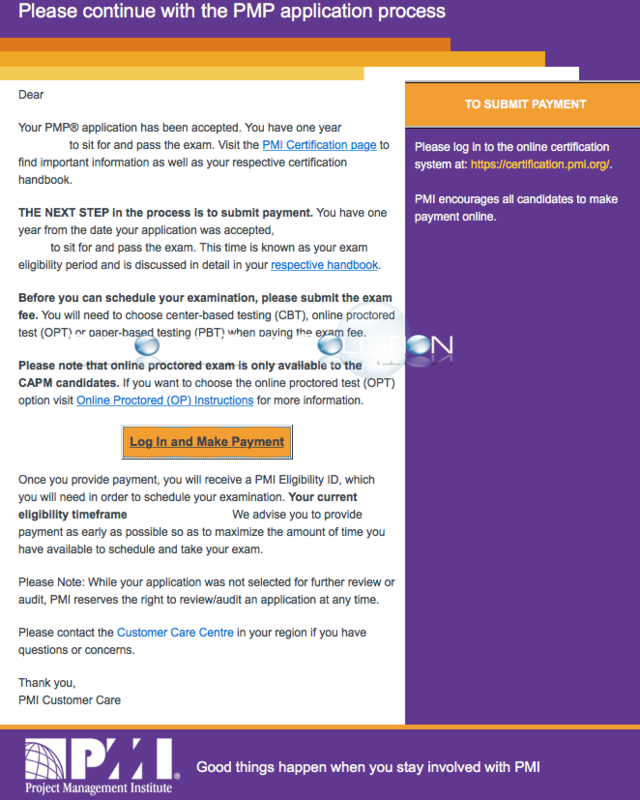 Please note that online proctored exam is only available to the CAPM candidates. If you want to choose the online proctored test (OPT) option visit Online Proctored (OP) Instructions for more information. Once you provide payment, you will receive a PMI Eligibility ID, which you will need in order to schedule your examination. Your current eligibility timeframe ends “”. We advise you to provide payment as early as possible so as to maximize the amount of time you have available to schedule and take your exam. Please Note: While your application was not selected for further review or audit, PMI reserves the right to review/audit an application at any time.